I really want to follow up on my Groovy Maven Blackberry work and so far this is all I can do. Yesterday I managed to actually run it for the first time in over a year or two since I wrote it. My earlier blog post was completely inaccurate, indicating that all you needed is the plugin source. It has a HEAVY dependency on RAPC, and I am not authorized to distribute RAPC. (I am also not authorized to distribute breakfast cereal to to my children because I’m not as calorie conscious and portion aware as I should be… says the wife.) In order to actually use my plugin you have to create one of various “rapc-compile-tools” bundles and list it as a dependency of the plugin. It’s very important the you be version aware when building and listing the “rapc-compile-tools”. Let me elaborate. In order for the magic to work you must create a Maven jar artifact which includes a “/Blackberry-utils/” folder holding these files. The plugin expands the files from the dependency into the system’s temp folder and then uses all of these files to actually perform the compile to cod format. It does a bunch of other (probably unnecessary) hickery-doodle to create a jar identical to what will be in the final cod. What you need to do is download a version of the JDE. Then create a “Blackberry-utils” folder somewhere on your hard drive. Copy each of the above listed files into this folder then jar the folder. You can find most of them in your JDE download which can be expanded by running the installer. (See my earlier post about running the Simulator on Mac for details on running Windows installers on Mac.) The sigtool files are created after you build and receive a RIM certificate. (If you don’t have a RIM certificate you can fake these files by renaming empty text files but they must be present for the plugin to work.) Finally deploy the jar to your Artifactory (or other) Maven repository. If you don’t use a local hosted Maven repository then you can manuallly create a pom file place a copy in the jar (I forget exactly where it goes but I think it belongs under /META-INF) and place both the pom file and the jar in a Maven conventionally formed path under “$HOME/.m2/repo”. The final path will probably look like “$HOME/.m2/repo/your/group/artifactid/version”. It’s to your benefit to install Artifactory or something equivalent to simplify both this deployment and future license restricted dependencies like javax.mail and commercial APIs. Its a rather involved process to create the rapc-compile-tools and I hope to simplify in the future. Also be version aware and you may want to create multiple versions of the rapc-compile-tools to support various Blackberry devices and OS versions. For instance, you may want to build version 4.3.0 for older Blackberry curve devices and 4.5.0 and 4.7 for the newer Storm, Bold, and Tour devices. What you DO NOT want to do is compile against 4.7 and deploy to a Storm running an older 4.5 OS. remember your target audience on blackberry is far less likely to update their firmware than an iPhone user. You’re also likely to run into users sporting the 4.2.1 and older OSes so use the lowest possible version of the RIM apis possible to build your application. 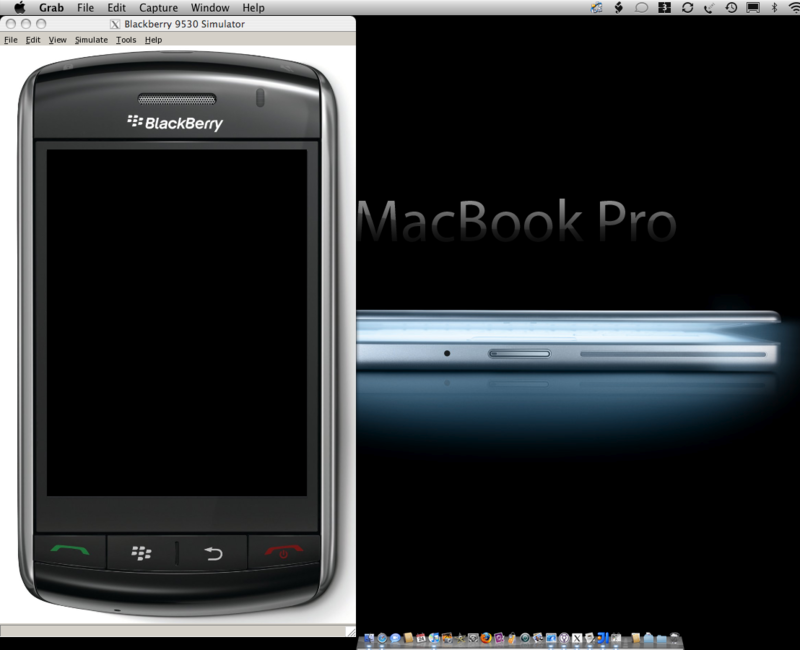 So I finally got the debugger attached to a Blackberry simulator. I can step through simple hello world apps in most simulators. I can’t debug our main app yet. I figured out how to hack a user supplied jad into a Blackberry project created with the Eclipse plugin. Its not straight forward. You can’t just add a Jad to the project. You can’t use the import command. You have to manually edit the “.jdp” file. I only know to do this because I remembered the rapc command line syntax. I also learned from my earlier JDE hacking, how to edit this file to add additional files to the project. I’m having trouble getting something more complicated loaded on the Storm simulator. It must be because I didn’t add the 4.7 component pack. Instead I tried to change the library variable created by the 4.5 pack to point to an existing net.rim.api.jar that I pulled out of a JDE 4.7 install. It’s late and the downloads for the rest of the component packs are taking forever. Why does the Blackberry update site want to authenticate you once for each component pack you download? I’ve spent the past year stomping around iPhone CocoaTouch grounds and today I’m happy to say I’m coming back to Blackberry. My first re-experience with Backberry development happened around lunchtime when I was researching a problem in our application. I needed to remember how to bring up stack traces but couldn’t get it right to save my life. Alt+LGLG seems to only work after you quit the app. I could swear I was able to do it from a running app before. (Maybe it’s the OS 4.5 update, maybe it’s just me.) then I needed to experiment with changing the permissiopns in the app. The thought was that disallowing all HTTP would bring up an error screen which would show me which server the app was talking to. I changed permissions. The phone wanted to reboot. I rebooted and it appeared like nothing had been changed. I changed permissions back. It wanted to reboot again. I accidentally told the phone to reboot later. Paranoid I switched permissions again to bring up the prompt. The phone no longer cared whether I rebooted or not. I switched permissions back and forth 5 more times with no reboot prompts and no change in behavior. I pulled my battery and continued switching back and forth. Then I gave up altogether. I then decided to reinstall the app using the old javaloader program. Though it appeared to reinstall I ended up with a phantom application. This is when the app is installed but invisible to both Javaloader and the Tools/Applications menu. Now I remember having a fix for this issue a while back but I don’t think I blogged it. Completely frustrated, I went to run the desktop manager. I thought it would be able to see and remove the phantom. Not being able to find desktopmanager on my PC (I uninstalled it some time ago) I went to reinstall it. Here’s my favorite part of Blackberry development. The final part of the Desktop Manager install process that pretends its hanging indefinitely. Had I not been through the install a few times before I would have pulled the plug. I’m done for now and ready to kick the next random object/person I see. Holla at me if you have a fix for phantom apps. *Update* You do need to download and install the JDE or the Eclipse JDE plugin to be able to build a dependency for my plugin. I incorrectly stated this is optional below because it had been over a year since I used the tool myself. I am writing a followup post to elaborate on the inaccuracies. I just committed three, count them, three maven plugins each written in Groovy over a decade ago (in computer years which is roughly 6 human months). These plugins are intended to make your mobile development life easier and, if you prefer Mac OSX, possible. I haven’t actually looked at the source code since they’d been written I just thought it was finally time to throw them out in the wild. I threw together a MIDlet helper Maven plugin to do OTA uploads to a slightly modified version of the Antenna OTA server. It should work with the official OTA server as well and if it doesn’t drop me a line and I can point to the single line of code that needs to be changed. I think it should do a PUT instead of a POST for the upload, my modified OTA server accepts either and I should just fix the dang file or post the modified OTA or both instead of rambling about it but since it’s easier to ramble than to do any real work, there ya’ go. This is my latest committed version of the Blackberry plugin for Maven. It’s the very same tool I used for compiling .cod files on my Mac way back. Alls yuh haff tuh do is install this Blackberry tools bundle in a secret location on your hard drive… or even better install a Maven proxy repo then pull the bundle from their. It’s simple yuh see… alls yuh haff tuh do is download something like Artifactory, unzip it, oh yeah… you’ll need something like Jetty to run the war file that you unzip… oops better grab Tomcat because I remember a lingering problem with Artifactory on Jetty, so yeah, get Tomcat right? Then configure it as a Windows startup service. Then maybe enable the admin and manager console cuz you’ll need to admin and manage it. Then maybe fiddle with the server.xml to get it on port 80, then mebbe you wanna put Artifactory in the ROOT context b/c you wanna be able to just browse the machine with a simple URL. Now why were we configuring Tomcat again? Oh yeah, the Artifactory thing that will eventually hold the extra bundle that the dumb rapc compiler depends on… You know what? Keep it simple. Copy/paste the repository folder from the Groovy svn location over top of your repository under ~/.m2. (Be careful on OSX because this is a replace copy instead of an append copy. Mac users should just drag the net folder from within the repository folder into their ~/.m2/repository). From there you should be able to use Maven to compile cod files from Java source. If everything works well enough, you should also be able to upload to an Antenna OTA server hosted in the clouds and then install to your device. Unfortunately the USB loader doesn’t quite work under OSX so unless you have parallels installed (in which case all the OSX specifics is moot) you’ll need to do it this way. The Blackberry plugin supports only Blackberry OS 4.3.0 and higher. While it will generate cods that run on earlier revisions of the OS you will be subject to the all too painful verification error. I was in the middle of making it compatible with earlier revisions when I hit a few snags, particularly with the rapc tools. To be perfectly honest I STRONGLY reccommend a different approach if you want to build for Blackberry OS < 4.3.0. These tools are sitting on the Groovy Subversion repository. You DO NOT NEED TO INSTALL GROOVY. You also do not even need to download/install the JDE. The only tool you need to use are the tools and compile to rapc files is Maven. Download/install Maven, check out from the subversion link, move the repository from the checked out folder into your $HOME/.m2 folder, and run “mvn install” in each folder then you’re all set! If there are any Maven/Groovy people out there that wish to help me build these tools out feel free to jump in. There’s articles on running rapc and SignatureTool.jar under Linux. Then they have a little piece on running the Blackberry emulators on Linux using Wine. I always thought this was possible now I have a reference.